THE KIDS ARE GONE FOR THE NIGHT. LETS GO CRAZY AND GO TO BE - ProudMummy.com the Web's Community for Mums. THE KIDS ARE GONE FOR THE NIGHT. LET'S GO CRAZY AND GO TO BED EARLY AND SLEEP UNINTERRUPTED UNTIL NINE IN THE MORNING. Anthony Challice this is literally us!! 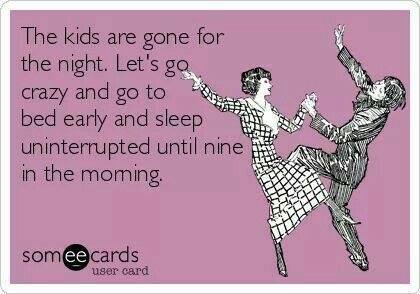 Apart from you wanting to call the kids every 10 mins and moaning you miss them!! Philip Crew we're so rock n roll!